(8 a.m. EDT) -- Explorer of the Seas arrived in the UK yesterday (April 23) after a 40-day refurbishment. The 15-year-old vessel has had 86 cabins added, increasing passenger capacity from 3,114 to 3,288, while 81 inside cabins have had virtual balconies installed. The ship is the latest Royal Caribbean ship to emerge from a fleet-wide $300 million revitalization program. 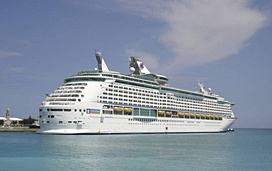 In February last year, Navigator of the Seas went through the exact same refurbishment programme. Explorer of the Seas will be sailing from the UK throughout the summer. The new cabins include 24 new “panoramic ocean view” cabins occupying a new section of superstructure added to Deck 12. The space used to be the forward extension of the ship's running track and surrounds the Vitality At Sea spa. The 81 inside cabins have been fitted with virtual balconies -- floor-to-ceiling TV screens displaying a live image of the view outside the ship. Symphony, Explorer's three-deck-high main dining room, has been re-fitted with stylish black and white chairs. One level is reserved for MyTime dining, but there are no plans yet to introduce Dynamic Dining, the controversial new anytime dining program that debuted on Quantum of the Seas in 2014. Other changes include: The Windjammer Marketplace has new table tops; a Chops Grille steakhouse has replaced the Portofino restaurant on Deck 11, and the port side of the Viking Crown Lounge now accommodates an Izumi Japanese sushi restaurant. What was formerly the upper level of The Chamber nightclub, on Deck 4, has been converted into a 62-cover Giovanni's Table. The former Champagne Bar on Deck 5 has been renamed the R Bar, while one deck below, the former Aquarium Bar is now The Tavern, with pretensions of being a sports bar. Outside, Explorer has been brought up-to-date with the addition of a FlowRider surf simulator and a 220-square foot cinema screen above the midship pool. The pool deck refurbishment has not, however, extended to replacing the aluminum and plastic sunbeds. Explorer will be sailing from Southampton throughout the summer, on cruises to the Canaries, Norway and the Mediterranean. In October, the ship leaves for a season in Australia before taking up residence in Alaska for summer 2016.